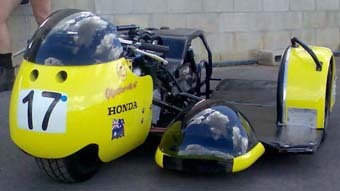 Ted Hayes Honda Post Classic Sidecar. I first started building my sidecar in about 1995.The frame is a highly modified 1972 Honda 500/4. The top of the frame including the steering head was cut away & then I fitted the steering head & front down tubes from and old Suzuki frame that Dave Buxton had given me. The Suzuki parts fitted down over what was left of the Honda frame & I then set the steering head angle to 65 degrees. trusty MIG welder. The plan was to use 6 x10 inch rims all round. The leading link front end was about the 3rd one I used before I was happy with the set up. The swinging arm was about the same to build with both front & rear made from 25x50mm box section. 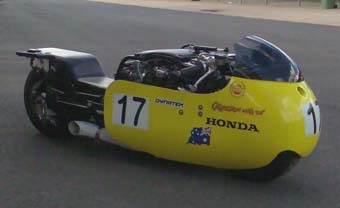 The sidecar platform was made from 30 mm square box section with a 19 litre stainless steel fuel tank fitted into the rear of the platform. The rest of the platform is 2mm aluminium sheet upholstered to keep the passenger happy. History tells me that all of the above should have been built around Honda’s 750 SOHC Four. As far as I am concerned they are not even the right shape for a boat anchor as I much prefer the Honda small block Four. What I started with was a 500/Four & now after being bored and stroked and bored yet again the engine in Sidecar 17 is now out to 763cc and about 40 kg lighter than the original 750 Four. All the engine machining was done by Robbie Glock and I thank him very much for that and all the encouragement & assistance he has given over the years. Getting the rear brakes and gear change rods working properly for a kneeler type sidecar takes an enormous amount of time to get them to a stage that you feel comfortable with. The exhaust is another story all together. What a job that turned out to be?. I have never attempted this job before and will not be doing it again in the near future. If there is anyone out there who is thinking about building a sidecar from scratch please don’t hesitate to contact me or any of the other sidecar competitors. 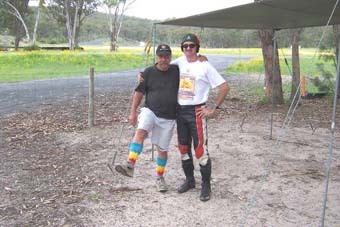 We can all be found at most of the meetings at Morgan Park Warwick or Carnell Raceway at Stanthorpe. Like Lex ( Dreier ) said at the end of his Beeza story, I would like to thank all sidecar owners, riders and passengers for there valued friendship over many years.